In the most recent issue of AAJ’s Trial Magazine (Jan. 2018), Alexandra Hamilton has authored an article entitled “A New View with Google Earth” which discusses the benefits of using Google Earth Pro in accident reconstructions. In her article, Ms. Hamilton refers to a 32-page research paper written by a team of ARCCA engineers and published by SAE International wherein they aim to quantify, refine and compare the accuracies of measurements obtained utilizing conventional instruments to the measurements obtained using Google Earth Pro software. As intersections, painted lane delineations, and other roadway features are constantly changing, the historical imaging feature of Google Earth Pro is sometimes the only way to accurately depict a collision site’s condition at the time of the accident being studied. 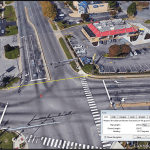 In addition, using Google Earth Pro to take case-specific measurements of the subject intersection can be more cost efficient than conventional methods and can limit unnecessary travel. Securing the most accurate measurements available could make a difference in the outcome of your accident case or claim. To learn more about how our Accident Reconstructionists use this tool in their investigations, contact Expert Shawn Harrington at sharrington@arcca.com. To read the research paper written by Shawn Harrington and several other ARCCA engineers, click here – SAE RESEARCH PAPER – HARRINGTON, et al.